The 2006 SUZUKI BURGMAN 400 SCOOTER for Sale is like new and FAST! The used Suzuki scooter for sale has only 5100 miles and it runs and drives like new!! I just had it serviced with synthetic oil, new plugs, all fluids changed and all filters changed. The Suzuki Burgman 400 has been exclusively adult owned and operated, never wrecked, dropped and is ready to ride anywhere! Gas prices are getting higher and the Burgman 400 gets excellent gas mileage 60MPG and it's no slow poke it will run 100mph if you want! PLUS...it's got a great looking paint job and everything works like new. A new scooter like this one retails for well over $5000 today. You must see it to fully appreciate its excellent condition and see that you are getting a bargain for my asking price. I'm looking to give $4100 for the scooter or you are welcome to submit a best offer bid when you e-mail me your questions and offers using the space below that has been provided by Strike Lightning Used Suzuki SCooters for Sale (and PLEASE do not neglect to include your contact information in your email or to provide a phone number or email address!) so that I can respond with answers to your questions or after consideration of your best offer as quickly as possible. You won't find a nicer used Suzuki scooter like my Burgman 400 for sale on Craigslist or in an Ebay auction so hurry and make an offer before it gets away from you! Strike Lightning would also encourage bikers to submit a review of the 2006 SUZUKI BURGMAN 400 SCOOTER for Sale to make the biker community aware of any problems that are commonly associated with the Suzuki Burgman for sale or to highlight its positive features and help potential buyers make informed decisions. 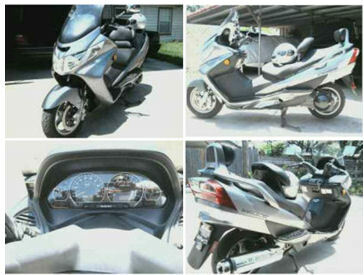 Here are the specs for the 2006 SUZUKI BURGMAN 400 SCOOTER for Sale! hello,..my name is keith and would like to discuss the sale of the bike,...very interested,.you can contact me at 313-412-1964 or at casualeye@yahoo.com.....thanks! I would like to make an appointment to see it soon. So please contact me at 281-753-5396 or email at ajzc@chevron.com. Interested in a trade for a v-star 1100 ? Interested in scooter. Where r u located? Could you please call me so we can discuss details at 620-432-1741?